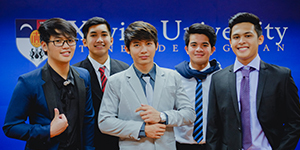 In 2010, the Quality Management Office (QMO) was established to develop processes and mechanisms to ensure quality standards, external quality assurance and excellent services expected of Xavier University. In 2011, the QMO formally began its active role in monitoring and evaluating accreditation processes and procedures of the educational programs. Through the years the QMO established its specific identity in the university and continued to uphold its vision, mission and core values. Added to the demands of educational reforms, the crucial role of QMO has been to ensure the quality standards of the university. To date, the Quality Management Office is accountable to the President. and to provide innovative recommendations that conform to the quality standards thereby ensure excellent service and global competence. The office is accountable to the University for the safe handling of sensitive information. Its contribution influences the academic, administrative and financial well-being of the institution. The office strives to maintain reliability and truthfulness in all its output and performance. The office exercises clarity in the execution of tasks and delivery of services in an efficient and effective manner resulting to better communication and mutual respect between/among colleagues and stakeholders. Quality Standards. Standards are established to ensure that all outputs (documents, policies, systems and procedures) are at par with other leading universities in the national and international arena. External and Quality Assurance. Monitoring is done to ascertain that the University is compliant with the external standards set by regulatory bodies and accrediting agencies. Excellent Service. The office aims to engage in a world-class service level in all of its transactions and contacts within and outside the University.